These foods are good for protecting the urinary tract and memory function from metabolic and dietary acid. -For slowing down aging and keeping the lungs healthy. They also lower the risk of some cancers. 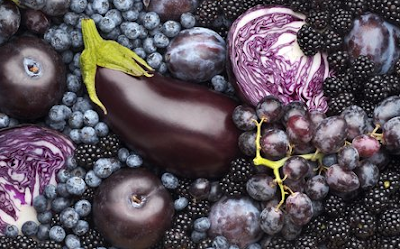 All blue and purple shaded fruit and vegetables add health-enhancing flavonoids, phytochemicals, and other antioxidants which buffer excess metabolic and dietary acid. Did you know the blue and purple in fruit and vegetables contain alkalizing nutrients (lutein, zeaxanthin, resveratrol, fiber, flavonoids, ellagic acid, and quercetin)? ...and limit the activity of acid that causes cancerous cells. Lastly, blueberries contain high amounts of alkalizing vitamins and minerals such as folic acid, potassium and fiber. So what exactly are the nutrients found in the alkaline blues and purples? Their Benefits: Derived from sulfur compounds in cruciferous veggies, these may slow the metabolism of carcinogens and metabolic and dietary acids. Cooking Tip: Steamed cauliflower is likely the best prep for retaining indoles. Tossed with chopped kale, mashed avocado and olive oil. Their Benefits: The phytochemical may lessen the effect of the acid estrogen in causing breast-cancer cell growth. Cooking Tip: Keep frozen berries on hand for smoothies. Blend them with spinach, avocado, and alkaline ice to buffer the acids or sugars in the mildly acidic berries. Their Benefits: These antioxidants or anti-acids improve brain function and balance, reduce metabolic and dietary acid that increases the risk for cancer, stroke, and heart disease. Cooking Tip: Try swapping in finely shredded cabbage for your typical salad greens, toss with avocado and purple onion. Note: Purple or blue fruit like purple eggplant, purple or blue onion, purple cabbage, red and purple cabbage, and purple or blue kale are all alkaline. Berries like strawberry, blueberry or boysenberry, plums, prunes and purple grapes are mildly acidic. Berries, plums, prumes, black currant are best eaten as transitionial fruit and only when in season. Great info. I'm glad I stopped by here. Now I know I gotta have more of those blue and purple fruit and veg. Thanks for the compliment! Its amazing how a few simple adjustments can have such a healthful impact. I grow the eggplants, berries and cabbage. However, this summer was tough on my garden. I didn't have the big harvest I usually get. -Looking forward to next year.